Bast Alpha Garrison • View topic - Hello! So excited! My name is Lisa and my husband's is MIchael. Saw ya'all in a parade a year back and I thought my husband was going to explode from happiness and excitement! He may have barreled over a few people to get close and have a picture with ya! I've been trying to get him to join ya'all since then! Been through some struggles these last few years so he just won't take the leap and spend the money on the costume. However, it is something he has wanted since I met him!!! Yes, you may have already guessed it but he does still have some (4 bins! worth) of new toys in boxes from 1978! (He sold the rest a few years back and bought a Harley!) He has Star Wars decals on his car and his laptop! His office has a 3' Storm Trooper and a Darth Vader standing guard along with an R2, some X-Wings and other Star Wars objects throughout! Our daughter bought him a Star Wars Drone for Christmas and he terrorizes the dogs with it all the time! He has two Star Wars tattoos one of which is a Storm Trooper. But not just ANY Storm Trooper - it's customized. We're from Cleveland, Ohio and avid Browns fans. So .... the Storm Trooper is Brown and Orange and wearing football gear and holding a football that is R2D2! He gets stopped EVERYWHERE so people can look at it! Our daughter is also an avid Star Wars fan and for her tattoo to honor her dad she has a Sugar Skull Storm Trooper Helmet on her arm! So, that all being said - he is in for a HUGE Surprise! I'm ordering him a Storm Trooper costume (Thanks Jeff!) this week and have signed him up as a member here. He just doesn't KNOW IT yet! The plan is for me to bring him to an event (has to be a day event because I work nights at Harrahs on Fri / Sat) and you'll just "HAPPEN" to be there! 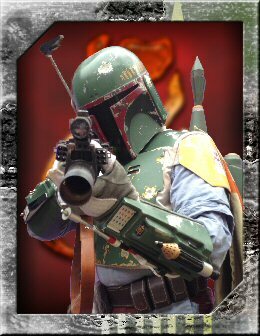 I'm thinking of typing up a Welcome to the Bast Alpha Garrison LA501st type card with the receipt for his costume inside and having one of ya'all give it to him. However - I am OPEN to suggestions on ideas to surprise him! 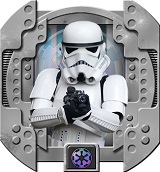 I know he is going to be a FABULOUS addition to your group and have the time of this life as a Storm Trooper! It's something he's talked about since he was a KID! And yes -- when he was a kid he MADE his own Storm Trooper Costume out of paper mache'! If I can find the picture I'll share it sometime! Looking forward to getting to know you all and surprising Michael in the next few weeks! Capture by design,kill by necessity. Welcome aboard! If I can help out with the armor, just let me know. Im holding a work day Sunday and you're welcone to attend. I hold them monthly. Re: Hello! So excited! - UPDATE! Ordered his costume and received email that it's on its way!!! Now - who wants to help me figure out a great way to surprise him with it!? Have someone in the garrison deliver it maybe? Ye. You and your husband should come out to the next event in the area. We can meet yall and introduce ourselves and ask him about joining. Then someone brings out the box! I love the idea of bringing him to an event. Where do I find the event calendar? I work nights at Harrah's on Fri / Sat but I'm off on Sundays.